Clematis (klem-at-iss) Buttercup Family (Ranunculaceae). Perennial woody climbers, many are prized for their fine foliage and showy flowers. The flowers do not have petals, but have petal-like sepals, often very large and striking. Clematis have opposite, usually compound leaves and attractive, feathery seed pods. The plants are useful for growing on stone walls, fences or trees; for training as porch vines on trellises; or for tying on posts. They grow best in a light, moist soil that has been enriched with leafmold and sweetened with lime. Best growth is in full sun, with roots kept cool by shading or mulching. 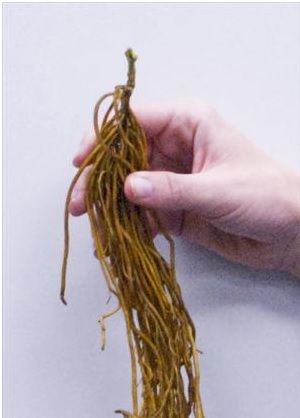 Plant bare root Clematis deep so the crown and one set of nodes is approximately one inch below the soil surface, leaving at least one set of nodes above the soil surface. • When potting up, insert either a stake or trellis in the pot. Since young shoots can be damaged very easily, it is best to insert your support system early. • Begin growing cool (40-45°F) so the roots can start growing before the foliage begins to make demands on the root system. Once the foliage reaches 4-5 inches tall, the roots should be established enough to the increase the temperature to 55°F to finish. • Water thoroughly, allowing plants to dry between waterings. To help prevent foliar diseases, water plants early in the day to allow the foliage to dry before nightfall. • If a fuller plant is desired, pinch back to three sets of leaves. Only one pinch should be necessary. Please note this may delay flowering.